Russia is deploying a regiment of its new-generation S-400 anti-aircraft missile systems in the far-eastern city of Nakhodka, not far from Vladivostok. 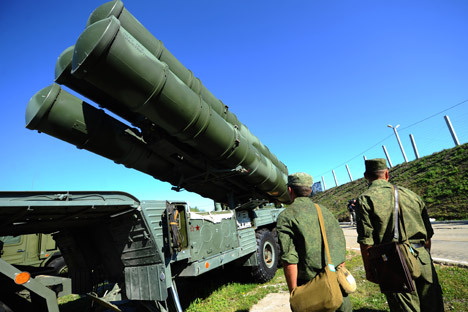 The production of S-400s is gaining pace. Within a few years, the new missiles will replace their existing analogues, S-300s, in all strategically important parts of the country. The S-400 Nakhodka regiment will provide air safety for an upcoming summit of the Asia-Pacific Economic Cooperation Organization (APEC), which will be held in Vladivostok on September 8-9. An event of that scale and significance may tempt large and small terrorist organizations to plot all sorts of attacks. Protection against such threats is a vital necessity. But the presence of S-400s in the Far East stretches far beyond the APEC summit. Among the countries whose aircraft or missiles may become potential targets for S-400s is Japan that has made its territorial claims for the Russian South Kurils more frequently and louder heard in recent years. Even though chances of Japan opting for a military solution are fairly weak, it would be imprudent to waive this scenario as altogether unlikely. It’s not solely a matter of the South Kurils, important as it certainly is. The Maritime region, including Vladivostok, is the stronghold of the Russian Pacific Fleet. There are a number of strategic airfields, the city of Arsenyev with its famous helicopter plant, and many other sites that need to be protected. Though S-400s went into serial production in 2007, only two regiments – four squadrons each possessing eight such systems – had been deployed by the end of 2011. This year, two more regiments have been formed – one in Kaliningrad (northwestern Russia) and the other in Nakhodka, both consisting of two squadrons. Under the State Armaments Program for 2011-2020, a total of 56 S-400 squadrons are to be created, which means that the S-400 production will have to be increased by 50%. To meet the assigned goals, new plants are currently being built by the Almaz Antey concern. Besides Moscow, the north-west, the Far East, the industrial Urals, and other regions where S-400s will be on permanent duty, they may also appear in the Arctic, which cannot boast of well-organized air defense infrastructure, except in the Kola Peninsula. The Air Force has a number of airfields in the Arctic, but without proper anti-aircraft defense they are pretty vulnerable. Deployed in Naryan-Mar, Vorkuta, Salekhard, Novy Urengoy and Igarka, S-400s will create a security umbrella over a huge territory from Arkhangelsk to Irkutsk against potential missile threats form the north.